The Hog 4 is the flagship in our newest range of consoles. Replacing the much loved Wholehog III, it embraces the latest technology, while retaining the Hog’s familiar control surface. Two internal 17-inch wide screen touch displays, motorized faders, a dedicated Grand Master, dedicated Intensity and Rate wheels, a third central touch screen and LCD backlit User Keys are the highlights of the console. Three monitor outputs, eight on board DMX outputs, MIDI input and output ports, 8 USB ports, 2 Fast Ethernet ports on a rugged Neutrik Ethercon connector allowing you total flexibility. 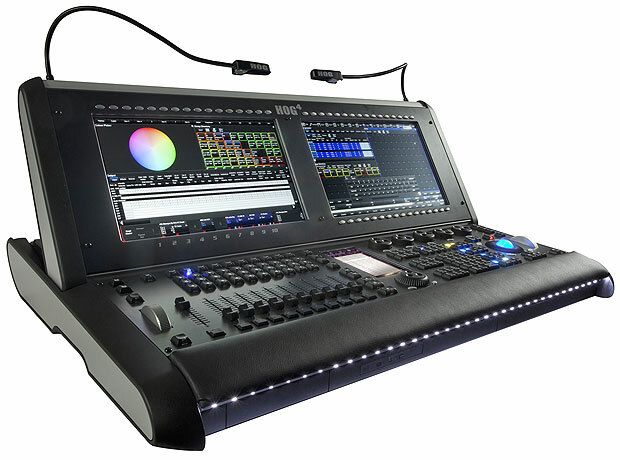 You’re prepared for everything from the smallest industrial job requiring a single console to the largest stadium show, theme park installation or Broadway spectacular requiring a multi console setup with full network backups.